What sets us apart from other carpet and rug cleaners? We use a combination of shampooing and clean hot water rinsing and drying. After vacuuming, we shampoo your entire carpet with a soft rotary brush to loosen the deep embedded soil particles as well as the surface oily grit. 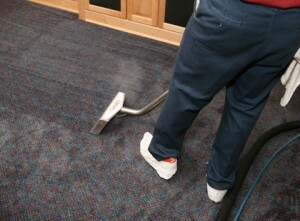 We rinse the entire carpet with clean, hot water at least two to three times. This ensures deep-down soil and residue removal. Rinsing with clean, hot water ensures that residue is removed and does not attract soil to your carpet which will keep your carpets cleaner longer. We get on our hands and knees to get at those hard to get areas along the baseboards, door jambs and around floor vents.